Topics: Trainer Bios, Group Fit, Group Fit Cardio, Workouts, Recipes, and Driving Directions. 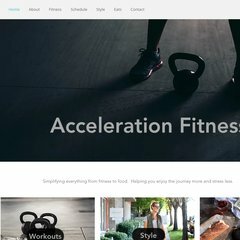 accelerationfitness.co.. Atlanta Certified Personal Trainer, Acceleration Fitness Personal ..
Monstercommerce Llc (Illinois, Belleville) is the location of the Apache/2 server. Its 2 nameservers are ns20.worldnic.com, and ns19.worldnic.com. Accelerationfitness.com's server IP number is 206.188.192.173.